meine freundin kati hat ende märz ihr erstes baby bekommen. ich hab mich nach der geburt angeboten ihr eine babydecke zu nähen. sie war gleich begeistert und hat auch ihre speziellen wünsche geäussert. da der zwerg schon 65cm groß ist, nach 14 wochen, hab ich die decke gleich etwas grösser genäht. sie misst 150x105cm. die daten der geburt habe ich in die ecken mit der maschine gestickt. my girlfriend kati has at the end of March her first baby gotten. I have me after the birth offer it one quilt sew. she was equivalent enthusiastic and has also its special wishes expressed. 2005 I had sewn for our neighbours already times one and just as one wanted kati now also…. 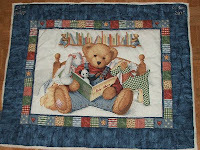 with the assistance quiltfriends I knew still such a teddy panel become. now at the beginning of August is baptizes and now becomes it slowly time, before the small boy comes to scool *g* since the baby is large already 65cm, after 14 weeks, have I covers equal somewhat more largely sewn. it measures 150x105cm. as back I will take a fleece and quilt the whole with the hand. with pressure it works itself nevertheless better; -) the dates of the birth I embroider in to hit a corner with the machine.